When 12-year-old Wes Pak learned that the cancer he’d been fighting for more than half his life had taken a turn for the worse, he was devastated. Doctors had recommended to his parents that they stop treatment, and they said he likely wouldn’t live to the end of the year. As the reality of the diagnosis set in over the next few days, Pak realized that he wouldn’t ever have a chance to play Fallout 76, which comes out in November. Pak’s family had pre-ordered Fallout 76 for him, and had chosen the Power Armor Edition which includes the helmet from the iconic Brotherhood of Steel armor set. A family friend reached out to Bethesda to tell the company about Wes’ plight. Bethesda’s assistant director in community and marketing Matt Grandstaff drove four hours from the company’s headquarters in Maryland to the Paks’ home in Newport News, Va., within a week of hearing about Wes. He brought with him a copy of Fallout 76, plus the first prototype of the Power Armor helmet he’d pre-ordered. It was signed by Bethesda director Todd Howard. Grandstaff and Wes spent the day playing Fallout 76 together. Since it’s still unreleased, Grandstaff had to take the copy of Fallout 76 with him when he left at the end of the day. 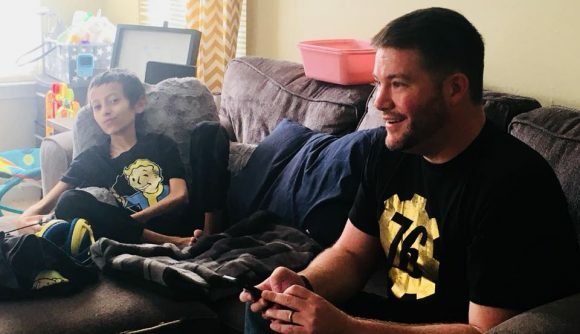 Wes’ mom, Krista Pak, told Babble.com that the day with Fallout 76 and Grandstaff “meant the world” to her son. Fallout 76 wasn’t the only thing on Wes’ bucket list. He also wants to help get people involved in cleaning the oceans and helping sea life, and he and his family have raised thousands of dollars in toys and other presents for other families in his area dealing with childhood cancer.